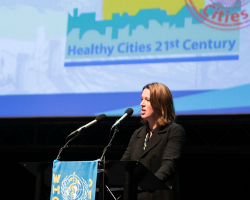 Catherine Calderwood, Chief Medical Officer of Scotland, speaks at the International Healthy Cities Conference, held in Belfast, United Kingdom. Participants have gathered for a 4-day programme with multiple sessions under the overarching theme of “Changing cities to change the world”, recognizing that urban centres have a vital role to play in sustainable development. Conference delegates immediately set to work on Monday morning at the WHO European Healthy Cities Network business meeting, where voting members of the Network discussed preparations for the next phase of work. The political vision and proposed goals of this phase align fully with WHO’s 13th General Programme of Work, the Health 2020 policy framework and the Sustainable Development Goals (SDGs). A series of 8 concurrent side events followed the meeting and highlighted examples of successful healthy city initiatives, ranging from health-promoting schools for children to technology to support active and healthy ageing. The afternoon plenary session opened with a powerful recital of the poem “Confidence” by Mr Colin Dardis, written to mark the 70th anniversary of the United Kingdom’s National Health Service and to pay homage to the ideal of universal health coverage. The Deputy Lord Mayor of Belfast, Councillor Emmet McDonough-Brown, warmly welcomed participants, noting in his remarks that Belfast was the 11th city to join the Network in 1988 and has been a key member ever since. The plenary continued with a focus on primary health care, making links to the 40th anniversary of the Declaration of Alma-Ata on primary health care. The Declaration will be commemorated during an upcoming global conference in Astana, Kazakhstan. Keynote speakers included Professor John Ashton, Senior Adviser to the Network, and Dr Bente Mikkelsen, Director of the Division of Noncommunicable Diseases (NCDs) and Promoting Health through the Life-course at WHO/Europe. Professor Ashton reflected on how far the Network has come in its 30 years thanks to continued support across political parties, which was core to the founding of the movement. There are currently national networks in more than 30 countries, and the movement is still expanding: Kyrgyzstan recently established the first national healthy cities network in central Asia. Dr Mikkelsen made the case for why cities should prioritize actions and investments designed to fight the rising epidemic of NCDs. The WHO European Region is rife with inequities in the area of NCDs and mental health. There is a pressing need for local action to address this growing burden through political commitment and broad stakeholder engagement. In a joint session, the chief medical officers of Northern Ireland and Scotland and deputy chief medical officers of England and Wales, United Kingdom, reflected on the challenges that lead to unhealthy cities and provided ideas for how to support cities in tackling these challenges. They underscored the importance of community engagement to design effective solutions. The first plenary concluded with presentations from representatives of both Astana and Almaty, Kazakhstan, showcasing those cities’ efforts to improve health and well-being. The Deputy Mayor of Almaty invited delegates to attend the next WHO Healthy Cities Summit of Mayors, to be held in Almaty on 23–24 October. The day closed with 8 parallel sessions sharing good practices of multisectoral strategies for urban health, followed by a welcome reception hosted at Queen’s University Belfast. Councillor Deirdre Hargey, Lord Mayor of Belfast, opened the second day of the Conference by expressing her hope that city leaders will have the chance to engage with counterparts from around the world and to benefit from the experience the Network has to offer. A vibrant interlude of Irish dancing by Celtic Storm provided a memorable and energetic start to the day, which continued with a welcome from Dr Michael McBride, Chief Medical Officer of Northern Ireland. In her opening speech on behalf of WHO, Dr Piroska Östlin, Director of the Division of Policy and Governance for Health and Well-being at WHO/Europe, noted that the Network must use the experience gained over the past 30 years to expand the healthy cities movement further throughout the world. Innovative and transformative approaches are at the heart of the movement, and these will be crucial to achieving the SDGs, using health as a cross-cutting platform. Mr Tony Fitzgerald, Deputy Lord Mayor of Cork and Chair of the Network’s Political Vision Group, and Ms Monika Kosinska, WHO Regional Focal Point for the Network, reflected on the Copenhagen Consensus, adopted by city leaders in February 2018, and its 6 Ps: peace, planet, place, people, participation and prosperity. These will form the basis for the Network’s next phase of work, based on the broad principles of building an equitable, healthy and sustainable future for all. Ms Kosinska also presented the draft Belfast Charter, which outlines the actions that cities will need to undertake in order to implement the political vision laid out in the Copenhagen Consensus. The draft Charter is currently open for comments, with the aim of adopting a final version at the close of the Conference on Thursday. Dr Agis Tsouros, International Adviser for Global Healthy Cities, emphasized that the agenda and priorities of the healthy cities movement have always been consistent with the big issues now embedded within the United Nations 2030 Agenda for Sustainable Development. He encouraged cities to “grab the big issues” and seize the opportunity to put in place credible and evidence-based urban health policies. In keynote speeches, Dr Brandon Hamber, Professor at the International Conflict Research Institute of Ulster University (Northern Ireland, United Kingdom), and Dr Ilona Kickbusch, Director of the Global Health Centre of the Graduate Institute (Switzerland), explored the relationship of health within development and security, peace and participation. The afternoon allowed participants to delve further into the themes of environment and health, peace, and urban design through 16 separate parallel sessions. The day concluded with a civic reception hosted by the Belfast City Council in the iconic Belfast City Hall. The final 2 days of the Conference will continue to examine key topics related to urban health, such as transformative approaches to addressing environmental and health challenges. Attendees will also have the opportunity to participate in a range of site visits throughout the city of Belfast.